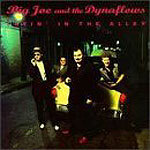 CD review: "Layin' in the Alley"
This review first appeared in the Fall 1994 edition of Blues Revue magazine. Big Joe Maher is a stalwart of the East Coast blues circuit. He's had previous releases on the regional Powerhouse label, both on is own and as vocalist for Tom Principato's reconstituted '70s band, Powerhouse. Maher has a smooth, booming voice, like the great blues shouters of yesteryear  Big Joe Turner, Jimmy Rushing or Joe Williams. But Maher and his band, the Dynaflows, play with more R&B bounce to their music than did the shouters. The music is vintage roots rock/R&B. Guitarist Rusty Bogart plays with a big, fat hollow-body sound; Jeff Sarli plays an acoustic stand-up bass; and Kevin McKendress lays down some mean boogie piano and organ. In addition to singing, Maher is also the band's drummer  and a fine one with a lazy-sounding swing that perfectly complements his relaxed vocal delivery. The songs are both originals that will become standards, like Maher's "Big Legs," and covers of tunes by James "Thunderbird" Davis and Turner. All feature tight ensemble work and sharp horn choruses under saxophonist Mark "Kaz" Kazanoff's direction. If you like good R&B/soul, in the mold of early Ray Charles or Dr. John, fronted by a larger-than-life singer who projects his joie de vivre into his music, then you'll dig Big Joe and the Dynaflows.